It's always fun to get an unexpected little surprise. Turns out, however, that she had another storebought terrarium hanging around (of course she did), so yesterday, when I popped over for a minute, she sent it home with me. Gotta love my Mom!! "What is this terrarium I speak of ?" you may ask...it's that cute little glass-house-looking-thingie in the background. It now has a home on the white buffet in my living room. And, you know what? It was the perfect touch! Thanks Mom!! EDITED TO ADD: I had some readers mention that they had seen a tutorial in Country Living. This very well may have been the tutorial my Mother has (the photo - below - looks like the terrarium my father made)...she subscribes to both magazines...but I can't get in touch with her right now to check...so I'm just going to post the link. Thanks to Nita from Mod Vintage Life and to Laura for telling me about the Country Living Tutorial! I would say a LOT of pretty! Love your items. Your mom and friends picked out some cute things! I did a post today about shopping at mom's house too! Sounds like both our moms have a great stash! I love your blog and it has been a huge inspiration for me. I just took the plunge and started my own blog. Your blog was the first one I ever read and it was like a choir was singing in the background and the heavens opened up. I didn't really have any idea what a blog was, let alone that there were other people out there who talk about things I love (home decor, quilting etc) I guess what I'm trying to say is THANK YOU!!! Hi! 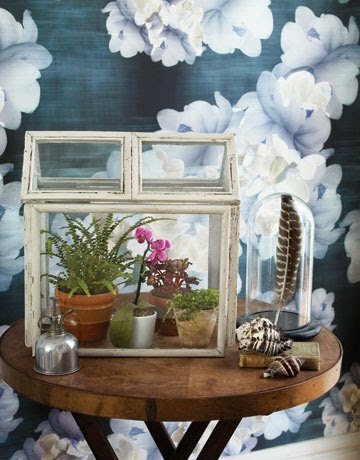 I remembered seeing an article on how to build a terrarium out of picture frames but didn't think it was in Martha Stewart although she may have done it too. The one I saw was in Country Living. I went to their website and whalla...found it! Here is the link for you and your readers....I'd love to make one of these. I have a large terrarium on a stand that I have yet to get around to filling. So no need to make another. Very cute! I like how you have everything displayed! What a truly darling terrarium you have,sugar. I don't have one but have been looking for one. Most are so costly I'm not willing to spend the money, but I may relent soon and get one I saw at our local nursery. It's stunning and I love it. Yes, you are a tease. Please post that link asap. I want to make one. Love your small one. I've never seen one like that. I love the terrarium your mom gave you! It looks so pretty sitting on your buffet, like it just belongs there! :) I am also so SO excited about the link to Country Living. I checked it out, and it doesn't seem that difficult of a project to make one! I will definitely bookmark this idea for a later time! I love terrariums. They looks good every where! WEIRD! I just sat down to read your blog after doing the dishes and washing down a terrarium I just brought in from the garage! I got bath products in it almost 10 years ago, and while I never actually did anything with it (except store packages of seeds in it) all these years, I decided tonight to see where it would work!! Moms are the best... they always have the perfect thingy we need hanging around the house!! I just love everything you did!! !